Check here for more programs from Julia James. Julia earned her BA in jewelry and design from London, and recently received her teaching credentials from Sonoma State University. 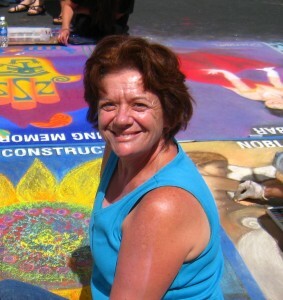 has been an Exhibited artist and Art teacher for over 20 years. Her work has been featured in exhibits by Artisans in Marin, an organization founded over 30 years ago by a group of local artists. Julia enjoys capturing landscapes, using watercolor or etching as her medium. Julia encourages students to use their imagination and to find their creative voice, using a variety of media. Julia teaches students basic art skills through lessons aligned with the California art content standards. Julia loves to share the knowledge of art and the creative spirit, believing that art is a wonderful process, which opens the door to many types of learning.